Announced in September 2003, the iMac (late 2003) was primarily a speed bump of the existing iMac line, with feature improvements to the 15" model to bring it to basic feature parity with the 17" model.The 15" model, with a 80 GB hard drive, 256 MB of RAM, 32 MB of VRAM and a CD-RW/DVD-ROM drive, was $1299. The 17" model, with an 80 GB hard drive, 256 MB of RAM, 64 MB of VRAM, and a CD-RW/DVD-R "SuperDrive" was $1799. 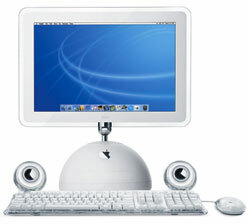 In November 2003, Apple introduced a 20" flat-panel iMac, with specs otherwise identical to the 17" model, for $2,199. All models were discontinued in July 2004.